Let's start focusing on the connection between mind, body, and soul. A little over a month ago I felt the need to switch things up. Whether most of you know this or not, I have been struggling with gut health issues and it has kept me from working out the way I want to. It left me feeling very uncomfortable and honestly frustrated that I was losing strength. There were some days where I would be concerned with the way my body looked, but for the most part I was genuinely concerned about not being as strong as I was. It may seem vein, but it was more so a representation of the struggles I had been having with my body that was the most frustrating part. I would throw myself into a week of high intensity workouts on top of teaching 15 classes a week and found my body hating me for it. I knew that as I was healing I wanted to incorporate more movement outside of just teaching, but I also knew I had to find a balance. I planned on going to yoga at Y7 one day and I ended up overbooking myself to the extent where I couldn’t make the class. 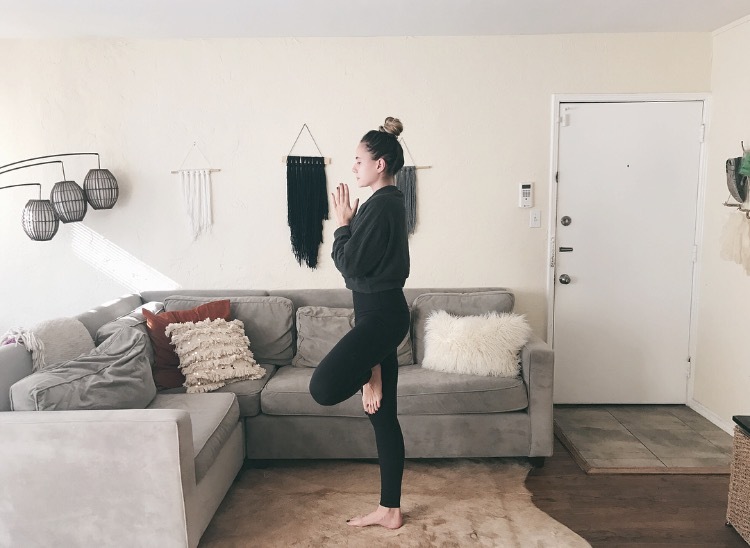 I knew that my body was craving yoga and I committed to doing it at home later that day. I struggle with at home workouts. I thrive being in a group of people who motivate you to go further and the powerful energy that is present when a group of people move together. Therefore, most of the time that I plan on doing something at home…it doesn't happen. But that specific day I had committed to it. I set an alarm on my phone and treated it as if I was showing up to a class. So at 3:30pm that day I rolled my mat out in my living room and followed through with my commitment. I put music on that helped me flow, turned it up louder than some studios would, and allowed myself to flow in a way that felt good. I was able to breathe, connect, and dig a little deeper to cater to exactly what my body needed. That day I decided to commit to 30 days of yoga. I could feel that this was what my body needed and I wanted to honor that. Whether it was 10 minutes or an hour, I committed to yoga every single day. Here’s what I found. Setting time aside everyday to stretch, breathe, and flow, is truly a form of self care. I am fully able to connect to my breath when I practice yoga and therefore slow down my body and my thoughts. The music I flow to allows me to go deeper, flow longer, and feel what I need to. It’s crazy how challenging it was to set time aside in my busy day, but never did I regret spending that time on the mat. Consistency is key. You will get stronger if you stay consistent. The more I am in my head, the harder it is for me to keep my balance, therefore spending a few moments setting an intention before I begin allows me to get present in my practice and flow stronger. 30 days of yoga was exactly what my body, heart, and soul needed to reset, recharge, and connect to my body. I am not a yogi, anyone can do yoga, and I rekindled my love for yoga in 30 days. There is a crazy amount of black lab hair on my floor, no matter how many times I sweep. Although the last one may seem a little funny (it’s true) these were things I found out about myself over the course of 30 days. Listen to your body and what it’s craving. Allow yourself to commit to something for an extended period of time and see how you feel. Follow through on your commitments and be amazed by the things your body can do. NEW YEAR // NEW ME?